Purpose: To compare corneal variations in patients undergoing one-handed and two-handed coaxial phacoemulsification. Setting: Eye Institute, Affiliated Hospital of Nantong University, Nantong, China. Design: Prospective consecutive nonrandomized comparative cohort study. Methods: Patients with cataracts were subject to one-handed (one-handed group) or two-handed coaxial phacoemulsification (two-handed group). 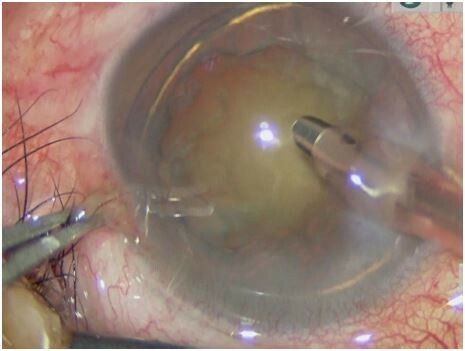 Intraoperative phaco parameters and postoperative outcomes, such as visual acuity, surgically induced astigmatism (SIA), corneal volume, central corneal thickness, and corneal endothelial cell counts/size were compared. Results: No significant differences in the intraoperative phaco parameters were noted between the 2 groups. At postoperative week 1, visual outcomes were significantly improved in the one-handed compared with the two-handed group (all P<0.05). Corneal volume, central corneal thickness, and average cell size were significantly decreased in the one-handed group compared with two-handed group (all P<0.05), but the aforementioned differences were ameliorated at 1 month and 3 months postoperatively. Endothelial cell loss was significantly decreased in the one-handed group compared with the two-handed group at any follow-up point (all P<0.05). No significant differences in SIA on the anterior surface were noted between the 2 groups. SIA on the posterior surface was significantly decreased in the one-handed group compared with the two-handed group at 1 week postoperatively (P=0.043) but not at 1 month and 3 months postoperatively. Conclusion: One-handed phacoemulsification has the advantages of less trauma to the cornea and better early visual outcomes compared with the two-handed technique.